Whether you’re looking for the best brunch spots or a private dining space that takes reservations for a crowd, Madison culinary scene is just plain good. In spring, take advantage of the sun by dining outdoors, or add water to your order with our list of 10 places to dine lakeside. Spring means fun runs and special events, from the time-honored Crazylegs Classic on April 27 to the Worlds’ Largest Brat Fest during Memorial Day Weekend. If you’re here during UW-Madison Commencement, there are also a variety of events happening that weekend, along with special offers for graduates. The country’s largest producer-only market will once again circle the Capitol Square starting April 13. More than 300 vendors are there to answer any questions—plan to bring home the best in vegetables, flowers, cheeses, meats and more. There are many farmers’ markets in the area, check out our Eating Fresh Off the Farm article to find one near you. 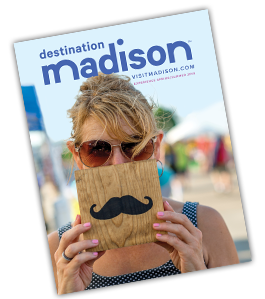 Madison was made for families—we have events and experiences that are unique and memorable for all ages. Read our rundown of how to do Madison with kids, which includes city staples like the State Capitol and Henry Vilas Zoo, and cultural choices like the Children’s Theater of Madison and Overture Center for the Arts.